Last week I wrote about Fritz Wiessner who was a skiing mountaineer best known for his ascents. This week I’m writing about a skiing mountaineer best known for his skiing descents – in particular, the first skiing descent of the Grand Teton. Chuck Perkins was quick to identify Bill Briggs as the first person to ski the Grand. Bill is a personal friend of Chuck and Jann’s. Bill was here in Stowe last October to help celebrate Chuck and Jann’s induction into the Vermont Ski and Snowboard Hall of Fame. 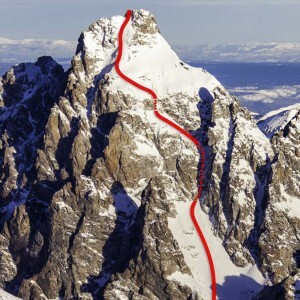 Bill Briggs successfully skied the Grand Teton on June 15, 1971. He had tried once before, but weather had forced him to abandon the attempt. However on that day in June the weather and snow conditions cooperated to produce a successful descent. Briggs says he was never worried about skiing down, but the climb was the challenge. He says that like all major mountaineering expeditions, planning was the key. After successfully completing his descent, Briggs returned to Jackson only to be faced with a lot of doubt from the locals. He contacted the Jackson Hole News. Virginia Huidekoper, founder and owner of the paper, and photographer Roger LaVake, went up in a plane the next day and took pictures of Briggs’ tracks down the Grand! My understanding is that you can still buy a poster of that picture. Skiing the Grand Teton was not the biggest challenge Bill Briggs ever faced. Briggs was born in Maine in 1931 missing one hip socket. When he was two years old, surgeons were able to etch out a socket in his pelvis to act as a joint. While his participation in sports was limited by the hip, Briggs did take up skiing at an early age. Most of his skiing was done on a slope near his house using his father’s skis. Briggs went to Philips Exeter Academy where he met a mentor that would shape his life. A teacher at the school, Bob Bates, was an accomplished mountain climber and had been part of the K2 expedition headed by Fritz Wiessner (aren’t connections like that amazing?). Bob Bates was also an inspirational teacher and Briggs decided to follow in Bates’ mountaineering footsteps. Philips Exeter also encouraged Briggs to continue skiing. Every Sunday he would take the ski train to North Conway, New Hampshire, for a day of skiing. On the return train trip, Briggs loved singing ski songs with the other skiers. Music would become Briggs’ second passion. 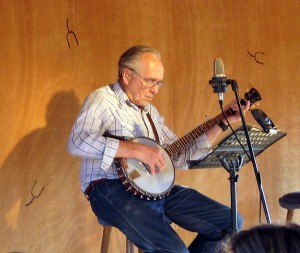 He taught himself to yodel, something he demonstrated at the Hall of Fame gala here in Stowe! Briggs went on to Dartmouth in 1953 where he immediately joined the Outing Club. Through this he extended both his skiing and mountaineering experience. Skiing Tuckerman Ravine introduced him to steep skiing and he developed his own style for the steeps. One companion described Briggs as “the most concise and controlled skier” he had ever seen. In the first summer with the Outing Club, Briggs was introduced to climbing in the Tetons and Canada’s Bugaboos, places that would become integral parts of Briggs’ life. Briggs left Dartmouth before graduating and chased his dreams of skiing, climbing, and music. 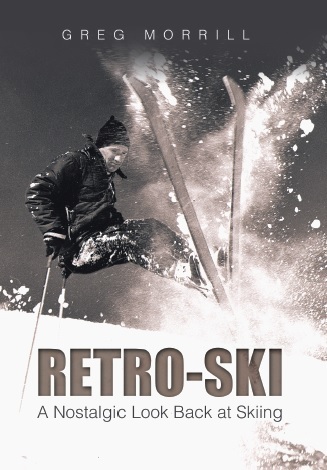 During the rest of the 1950s, Briggs would move around as a ski instructor, from Franconia in New Hampshire to Aspen and eventually to Woodstock, Vermont. It was from Woodstock that Briggs planned an expedition that many might consider more of a challenge than skiing the Grand. He and a bunch of his former Dartmouth Outing Club buddies would climb and ski a traverse of the Canadian Bugaboos in 1958! By the 1960s, Briggs’ hip became a problem and he had it fused. His initial rehab did not go well and he became worried that he might never be able to ski or climb again. Briggs credits his conversion to Scientology for his physical and mental recovery that allowed him to resume skiing and climbing. 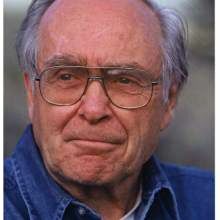 In 1966 Briggs was named ski school director at Snow King Mountain in Jackson, Wyoming. Bill Briggs still lives in Jackson and if you drop into the Virginian Bar at the right time, you’ll find Bill holding court and maybe doing a little singing. Cool article. You marked the wrong route though. That’s the otter body route, he skied what’s called the Briggs route down the Stettner couloir.